I recently picked up this crafty little mini mascara set at Sephora. I have never found my 'perfect mascara' so instead of wasting a lot of money on designer versions that wind up making my lashes clump together I tend to picking mine up from the drug store. 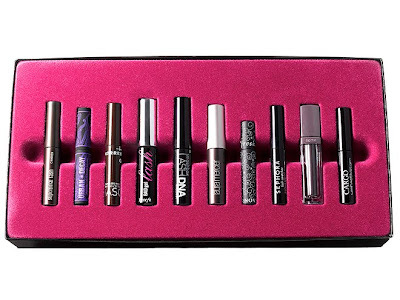 You really can get good mascara for under $5. But, I have always thought that there must be something more... and that I just had not been united with my perfect mascara yet. So, when I found out that Sephora was doing a pack of 10 mini versions of some of their most popular mascaras I thought this surely was the solution. Only $39 and I could test run 10 different ones... surely my soul mate would be hidden within the pink pink case somewhere? Sorry to disappoint.... as of yet I haven't found 'the one.' Probably because I have only tried two so far... but both were surprisingly good. I will try out each of the 10 different ones over the next 10 days and give you a run down of how they each are at the end. Sound good? Do you have a perfect go-to mascara? Is it expensive or from the drug store? 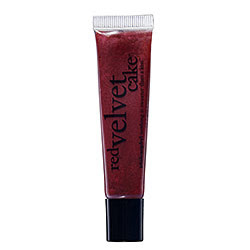 Philosophy Red Velvet Cupcake Lip Shine. Mmmmm.... red velvet cupcakes. Good. The taste of them on your lips all day without sacrificing the New Years resolution... real good. This seriously tastes divine (not in a sickeningly sweet get-this-off-my-lips sort of way) and gives your lips a nice little tint of colour without looking like you have tried too hard.